The bandit of the forest, raccoons are a masked mammal native to North America. Mostly nocturnal, raccoons eat just about anything they can get their paws on. Their natural diet consists of fruits, berries, frogs, crayfish, insects and eggs. Be careful because they won't hesitate if something in your trash smells good to them. 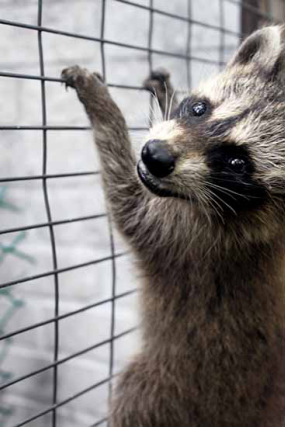 Raccoons have been known to "wash" their food by dunking it into water. Use a pair of gloves, towel, or a blanket to help you pick up the animal and place it in a lined box. Cover their eyes and head with a cloth. It will calm the animal and hinder them from seeing, as well decrease the changes of being bitten. Call a rehabber as soon as possible to get help. Do not touch them with your bare hands. Do not give any food or water until you contact a rehabber.